The first thing I did when preparing to build these countertops was to accurately measure the length and depth of the base cabinets. The bowling lane was a full 3″ thick. It came in linear feet, but they wouldn’t cut it down, so I had to buy enough pieces to get what I needed, and had a bit left over at the end. I ended up buying two pieces of bowling lane at 10′ lengths each. It was in full-lane width which is 40.5″, and my base cabinets were 24″. This wasn’t a huge issue since bowling lane is made from individual planks of wood on end, glued and bracketed together. Dealing with long sections of bowling lane is not super easy. The bowling lane at 40.5″ width consisting of 39 boards at 3″ thick ten feet long was very heavy. I didn’t weigh the lane, but I’d estimate its weight around 300-350 lb or more. In order to get the custom bowling lane countertops to width, I had to flip the lane on its top. Then I had to remove the 100+ year old brackets that were attached with 2.5″ flat-head screws. The slit on the screw head was abnormally wide, and very hard to remove. Each piece of bowling lane had three brackets, and each bracket had 4 screws. Once the brackets were removed, I used a wood chisel and wedge to split the lane at the board needed to make my piece 24″ wide. The individual lane boards are glued and also nailed to each other, but since they were no longer bracketed, it came apart fairly easily. Once the bowling lane was the correct width, I cut it to length using a circular saw . The men I bought the lane from suggested that I not use a new blade because the nails in the lane will ruin it. Just use an old blade and take your time with the cuts. 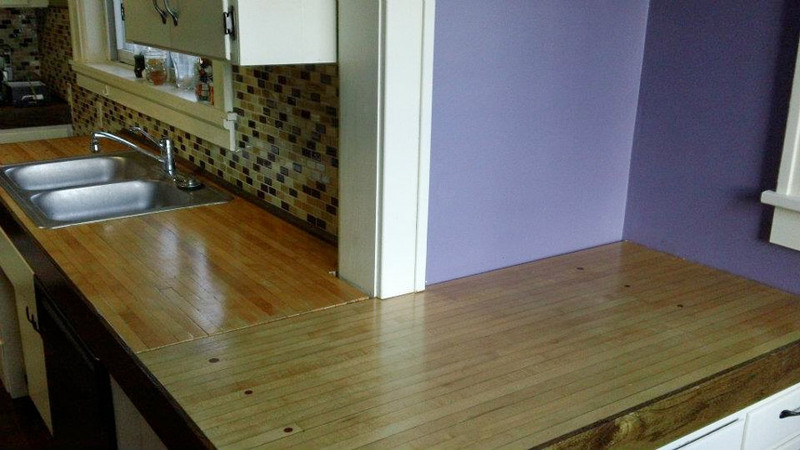 Once I had all of my custom bowling lane countertops cut to size, I made a cardboard template from my old Formica countertop to make another cut for the kitchen sink . I used my circular saw for the cross cuts, and used a hammer to pound out the middle pieces. The corners of the original hole were rounded, so I used a jig saw as well as my wood chisels to make the opening perfect. All the pieces were cut to size. Now I had to sand the layers and layers of varnish off the lane to reveal the original maple wood planks. Once the lane pieces were smooth, I cut walnut trim for the sides that would be overhanging the sides of the cabinets. I installed the smooth bowling lane countertop pieces onto the base cabinets using plywood as a substrate. I screwed the pieces from the bottom through the plywood substrate. Then I added the walnut trim. I used 1×4’s which are actually only 3.5″ wide, and let it overhand the bottom of the bowling lane, over the edge of the cabinet. Once fully assembled, I used polyurethane to seal the whole counter. I did this in place. It was smelly and messy, but I had the windows open and ventilated the area. 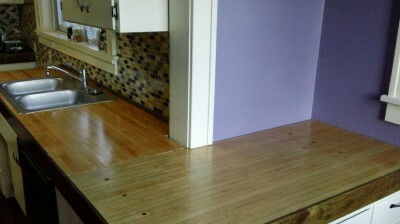 The result was bowling land smooth custom countertops. A Handy Father is willing and excited to share his knowledge and experience, so if you have any questions lat me know in the comments below. DIY custom bowling lane countertops were one of the most rewarding projects I’ve been part of and would be happy to share any information I can. I'm about to start this same process and was wondering why you didn't get a heavy duty floor sander and sand the lane first? I used a uni-directional belt sander because it is what I had, and I had rented a floor sander when I redid my floor. I really hated using it. If I do it again, I will do the hand-held belt sander the same as last time. Thank you for the question! Sarah, I am so sorry I didn’t see this comment until now!! If the lanes can be removed and sanded down, I’d recommend doing that, but if not, you could get by with a hand sander. Then do several thin coats of a urethane to make it shiny and water-proof again. One of the other benefits to removing the lane and refinishing would be that you could get some glue in the cracks and clamp it together again, and it would be much stronger.